Now this is why I still love making fakes. MUGEN programmers take my creations and turn them into living pieces of art. <br/> <br/><a href="https://www.youtube.com/watch?v=2lVlbew-Hd4">https://www.youtube.com/watch?v=2lVlbew-Hd4</a> <br/> <br/> <br/>This is still just version 1. <br/>I plan to make more props and changes so it resembles MKX more closely. 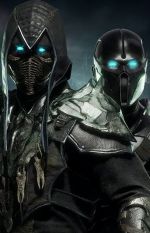 <br/><img src="http://orig14.deviantart.net/53eb/f/2016/198/5/1/quan_chi_s_fortress__mkx__by_blacksaibot-daadjyj.png"> <br/> <br/>This was created for WeaponTheory. Now this is why I still love making fakes. MUGEN programmers take my creations and turn them into living pieces of art. This is still just version 1. I plan to make more props and changes so it resembles MKX more closely. This was created for WeaponTheory. That looks awesome! Really put together well, with nice detail. Love the lanterns. MUGEN, and the various MK versions/mods of it have always been interesting. Glad to see folks are still at it! Bunch of my old stuff is stll floating around out there too. Wish I knew about programming or had a good enough computer to contribute again. sry ive been so out of touch lately. ive went thru this forum and ur deviantart page. thnx for posting my work online and it sux what happened to ur MK Fakes Portal website. I think deviantart is better and more reliable NEway .. it just sux u cant customize the site to look anything but like deviantart. I think I will try and make a fake just for old times sake. i cant even remember the last one i made.... was it cassie cage vs kano? i dunno. omg.... omFg.... s...sa....sai...........saiz.............................saziero?!?! <br/> <br/>Veno is locked in my baesment. Veno is locked in my baesment. <div class="forumQuote"><b>saiZero Wrote:</b>>I think I will try and make a fake just for old times sake. i cant even remember the last one i made.... was it cassie cage vs kano? i dunno. <br/><br/></div> <br/> <br/>Can we expect a new fake THIS YEAR? :legacy_grin: <br/> <br/>... and more of you? saiZero Wrote:>I think I will try and make a fake just for old times sake. i cant even remember the last one i made.... was it cassie cage vs kano? i dunno. Can we expect a new fake THIS YEAR? ... and more of you?